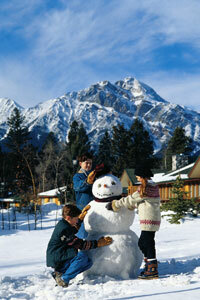 The Fairmont Jasper Park Lodge is no doubt the best ski accommodation available in Jasper. Situated a little out of Jasper town on the shores of picturesque Lac Beauvert with wooded surroundings, you will feel at one with nature at this luxurious yet rustic hotel. 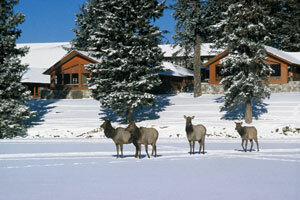 Elk and deer often wander through this hotel complex. 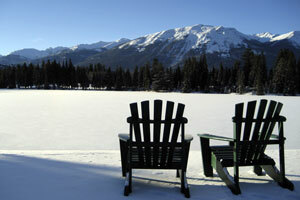 The Fairmont Jasper Park Lodge offers a village of cedar chalets and heritage log cabins connected by picturesque paths. The Fairmont Jasper Park Lodge's superbly-appointed 446 guestrooms, suites and signature cabins offer the perfect romantic winter getaway or family ski holiday in Canada. You will be able to enjoy homelike comforts and amenities surrounded by incredible views of majestic mountains. The Fairmont Jasper Park Lodge makes it easy for your family to dine together as children under the age of 5 years eat FREE! Children 12 and under also have a specialised menu to choose from.